Payments of Dividends and Capital Gains. 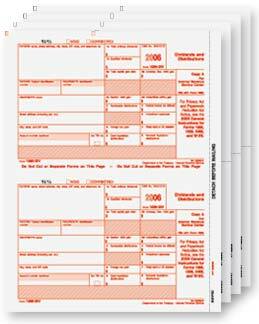 This 4-part laser set includes preprinted Copy A (federal, red scannable), Copy B (recipient) and two Copy C (payer and state). All 8 ½” x 11” sheets are printed on 20# laser paper 2-up with a side perforation. Print each copy as a batch. Order the quantity equal to the number of employees for which you need to file, you’ll get all the necessary forms. Mail payer copies in a batch to the IRS. Mail recipient copies in envelope #RDWENV05.